Couples planning to get married next year should book early because food prices and other costs are shooting up, wedding organizing companies warned Thursday. And the industry is expecting a busy year as the first "only-child' generation is reaching marrying age, 20 for women and 22 for men. 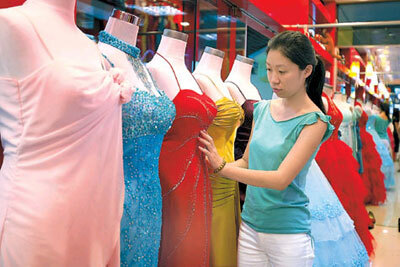 A lady chooses a wedding gown at a shop in People's Square of Shanghai on August 16. The Shanghai Really Wedding Service Company said more than 20 couples have already booked the service for next May Day holiday. "At present, we charge 4,000 yuan (US$515) for using paper flowers for decoration, and 5,000 yuan to 6,000 yuan for fresh flowers," said Cui Zhenzhen, a staff member. Cui said if couples wait to book the service in March or April next year, wedding management companies are very likely to be unavailable. Tangsheng, another wedding service company, said a dozen couples have booked the service for next year, 20 percent more than last year's bookings for the same period. "The ultimate quote for the service next year is still under discussion, but we reckon it'll be higher than this year's," said Wu Xia, director of the company. Food prices will also make banquets more expensive next year, experts warn. The Garden Hotel said wedding banquets now cost 4,288 yuan a table, and the price may be 200 yuan to 300 yuan higher next year. "The price of meat, bean products, sugar, oil and other materials have risen, so the banquet will also be a bit more expensive," said a hotel official called Du. Zhou Jixiang, director of the marriage department with the Shanghai Civil Affairs Bureau, said the wedding peak of recent years is because the first "only-child" generation has reached marrying age. - Marriage After Graduation -- Wise Decision or Rash Action?